Note: The following devotional article was written by Michael Cressin. Mike discovered CRBC after hearing our snow cancellation notice on local radio. He joined with our church plant in the early days and is now a founding member of our church body. Mike serves as our greeter coordinator and schedules our Lord’s Day Scripture readings. Prayer is an essential dimension of a Christian's existence. Prayer is the constant, ongoing sense of God's presence and power in a believer's life. It is the arena where the Spirit of God meets with the human spirit. Prayer brings necessary growth. It enhances a Christian's sense of God's presence and providence within his life. Just as the fish of the sea must live in an aqueous medium and breathe oxygen through their gills, so the Christian must live in a Godly atmosphere and breathe His Holy Spirit in order to survive and thrive in the faith. A personal prayer life is certainly not an easy thing to cultivate. The fast pace of our contemporary society and what appears to be an ever-increasing hostility of our world towards the gospel makes it often seem like an uphill battle. Nevertheless, it is simply an absolute necessity for a Christian to have a personal prayer life. As with any living growth process, food is needed. God gives us the ultimate manna from heaven in and through His Word in the Holy Scriptures. By cultivating a familiarity with the Bible and all that is contains we are fed the essential food for our growth in grace. But how does this relate to our personal prayer life? And what exactly is the relationship between prayer and reading the Bible? First of all, we must realize that prayer is much more than merely piling up petitions. It is not a laundry list of wants and needs. Yes, intercessory and petitionary prayer is one aspect of Christian prayer, but it is far from the total picture. Praise, thanksgiving, repentance, meditation and simply listening or waiting upon the Lord are all essential elements of prayer. If we are merely reading some Scripture and then spouting off a list of petitions to God we are missing out on the real power of prayer. The Word of God has been given to the Christian Church as “a light to our path” (Psalm 119: 105). Jesus said, “ If you abide in my word, you are my disciples indeed and you shall know the truth, and the truth shall set you free” (John 8: 31-32). What does Jesus mean by abiding in His word? This is exactly what personal prayer should be. It is time set aside to abide in God's Word, to really absorb the truth contained within the scriptures, and to experience the transforming grace of God. The first hurdle that one must get over is simply the setting aside of time to pray. I have known many Christians who have the tendency to put prayer time on the back-burner. “Oh, I'll get to it, if I can find the time!” If this is our attitude, chances are we won't find the time. In our contemporary world our lives are indeed busy. 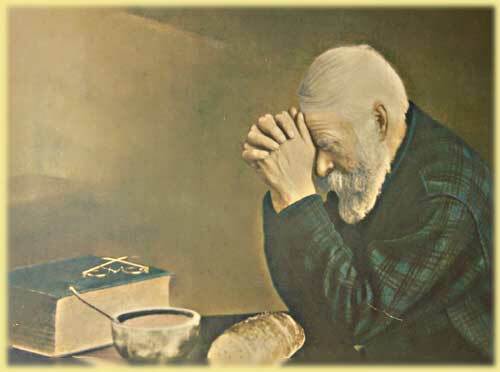 In order to find time to pray, however, the Christian simply must take the time. He must set time aside specifically marked out as prayer time. Here I would like to suggest that the reader commit himself to not just one but two daily times for prayer. I strive to have an AM time and a PM time. The morning time tends to be a short span, while the evening time can usually be longer. By setting aside these two time periods, two daily focal points, one's day becomes framed around two periods of concentrated quality time with God. Often these two times can be inter-related. All or some of the same passages from the Bible can be utilized within each. For example, in the AM period I might read and consider John 8:1-12, the passage dealing with the woman caught in adultery. Using the same passage in the evening may very well yield some deeper understanding of the text. This PM time could also be used to look up related Scripture passages, particularly if one is employing a Bible with cross references or footnotes. Further time might be spent in reflecting on how this passage has relevance in my own life. I might ask the Holy Spirit to help me have a more Christ-like reaction to people trapped in serious sin. Or I might simply repent of my own sins and ask God for help in avoiding them in the future. Taking time to pray with the Word of God means that we must slow down. Quality prayer time is never hurried. In prayer we cannot read the Bible the same way we read a newspaper or a novel. Yes, it does contain good news for us, and yes, it is filled with intriguing stories, but reading Scripture just to get through it will be less than productive. Asking the Spirit to help us concentrate can help focus our minds and rid them of distractions. Slowing down and persevering is essential.